Dust of My Wings was my introduction to author Carrie Ann Ryan. And a good introduction it was too, since now I want to read her Montgomery Ink – series and the next one in Dante’s Circle – series, Ambrose’s book. But now I’m getting ahead of myself. I’m quite excited to constantly find these new (to me) authors and learn new standpoints on paranormal romance and urban fantasy. According to Ryan, every human carries diluted supernatural traces in their DNA and sometimes something triggers these dormant supernatural features and transformation happens. And there are pure supernatural creatures living among the human all the time. Dust of My Wings was more a novella than a full novel, but Carrie Ann Ryan fills the pages well and nicely paves the way for the next books in the Dante’s Circle -series. This time my inspiration came early in the book when Shade took Lily to their first official date. They drove on and she leaned with him into a turn, his hard body pressed against hers. Apparently, riding a motorcycle was a form of foreplay. Who knew? They finally pulled up to a Korean restaurant she loved. How did he know? “I’m great.” Really. She had never felt better. “Okay, so get off like you got on, and you should be fine.” She did, and took off her helmet and shook out her hair. She re-clipped it and took off her glasses to give to Shade. He locked up the equipment and held her hand. This Korean style chicken dish can be made either in skillet (cut the chicken into bite size pieces and few hours of marinating will do) or on a grill. I decided to make the dak bulgogi on my coal grill, so the marinating time will be longer for bigger pieces of chicken, overnight preferably. 1. Peel and grate the garlic cloves and ginger (about 4 cm piece). Squeeze the half a lemon. Mix the lemon juice with soy sauce, brown sugar, mirin, grated ginger and carlic, sesame oil, sesame seeds and ground black pepper. 2. 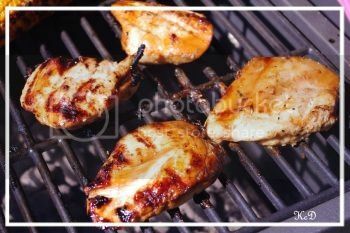 Take a plastic zipper bag and layer the chicken with the marinade into it and finally pour the rest of the marinade into the bag. Seal the bag and put into fridge for overnight. 3. Take the chicken into room temperature hour before cooking. Cook the meat either in a skillet or in a grill until cooked through and slightly caramelized. 4. 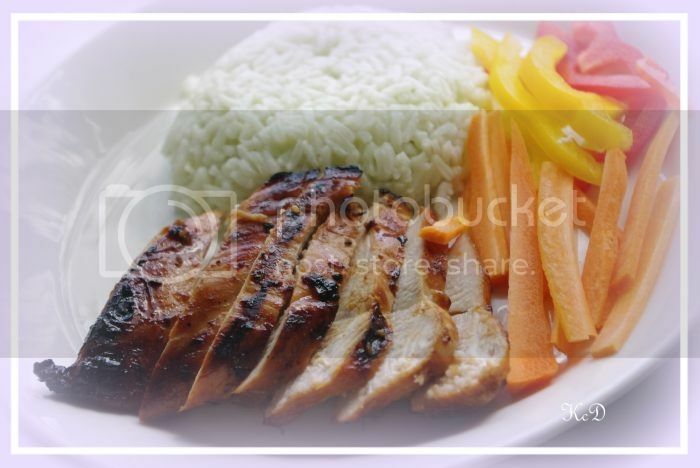 Serve with jasmine rice and thinly sliced vegetables seasoned with rice vinegar. This book had very enticing cover 🙂 but it was only part of the why I chose to read it. I was also intrigued by the author since I’ve never read any of her books before. Shade is a warrior angel, executor of verdicts of angel council and protector of supernatural secrets from human. Because the human have no idea of supernatural, mythic creatures living among them. And according to Ryan, every human has something supernatural in their DNA, just so diluted that no one’s aware of it. Shade has one problem, his wings or better, the dust of his wings. Whenever his emotions peak, he leaves trail of blue-silver dust behind. Normally human wouldn’t notice it, but now somehow a large amount of that dust has gotten into hands of lab tech and Shade gets orders from angel council to retrieve it before they all get exposed. Lily is working as a lab tech, doing soil samples until one day her boss gives her a vial of unknown substance and orders it to be analyzed asap. And that’s how Shade’s and Lily’s paths cross. Dust of My Wings is a good book, there are lot of characters so the series get a good start. The book was more like novella instead of full size novel and that made the story a bit shallow and the storyline a bit thin. And of course all the clichés of the genre were used, but I don’t mind, Carrie Ann Ryan used them well.